In the context of the show “Steven Universe” Beach City is where most of the characters live work and spend their leisure time. Aesthetically it’s a very soft and bright town. The combination of the cities color scheme and it’s proximity to the beach, the waves, as well as the sugary, salty vendors by the boardwalk, give the city a kind of tranquil levity. But similar to the post-apocalyptic setting of adventure time, just beyond the city is evidence of it’s supernatural history and relationship to otherworldly beings. Beach city is located on a kind of peninsula, where the beach and the ocean lie to three sides of the town. The town has a lot of interesting attractions, the largest of which is probably the Amusement park that sits on the boardwalk north of the city. The main attraction of the park is the large Ferris wheel but beyond that there are few carnivals stands. On the southern side of the city is another boardwalk, along which are a few of the major shops featured in the show. One of which is a Donut shop with a glass storefront called The Big Donut. 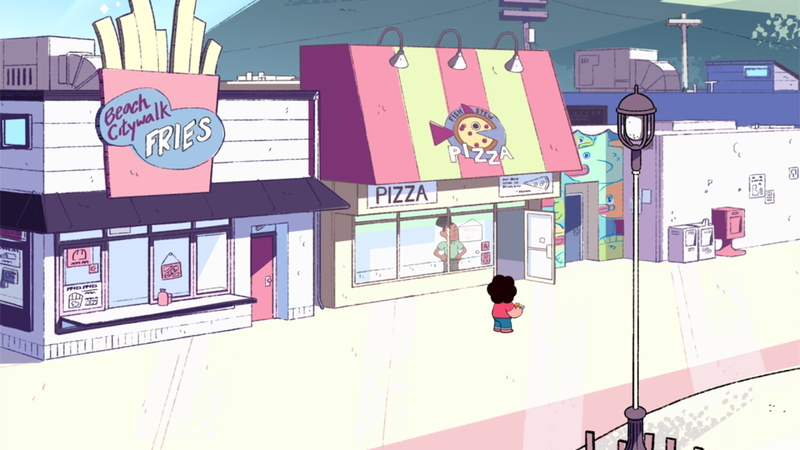 Two others are Beach City Fry, a fried food shop run by the Fryman family and a pizza parlor called Fish Stew Pizza run by the Nanafuea family. Steven the main character of the show lives with his guardians a distance away from the city, on its remote eastern shore, in a kind of beach shack. The beach shack itself sits in the hands of a statue carved into a mountain. Atop the mountain is a lighthouse that looks out into the ocean. At the brightest and least articulated end of the spectrum, The buildings of Beach City, as well as the planks that make up the boardwalk often take on textured white color, which fall into the near white yellows of the beach itself. Upon that base pink and blue pastels are colored throughout the city. So, for example, most given building will be white, but the doors may be a pale pink or blue. Or if the building or structures are patterned, like the Beach City Water Tower and Sign, the patterns are often colored in the same pale pink or blue. Combined with the very pale blue of the water, and the bright greens that color the landscape outside the city proper, Beach City comes off as spacious and relaxing. The only element of Beach City that’s consistently richer in color is the Sky which is usually a deeper shade of blue than seen throughout the series palette. But even the sky is broken up by bright white clouds. Resonance: Background Levity lifting characters into Space ... and Aliens. What resonates with me about Beach City is how as a background it emphasizes the personalities of the show’s characters. Primarily through the use of color itself. Every aspect of Beach City, from the building to the boardwalk, to the shore are all colored in very bright pale hues. And those bright hues give the show a kind of levity and spaciousness, that contribute to the lighthearted feeling of the show. But they also help emphasize the colors that the characters wear and by extension the personalities of the character. 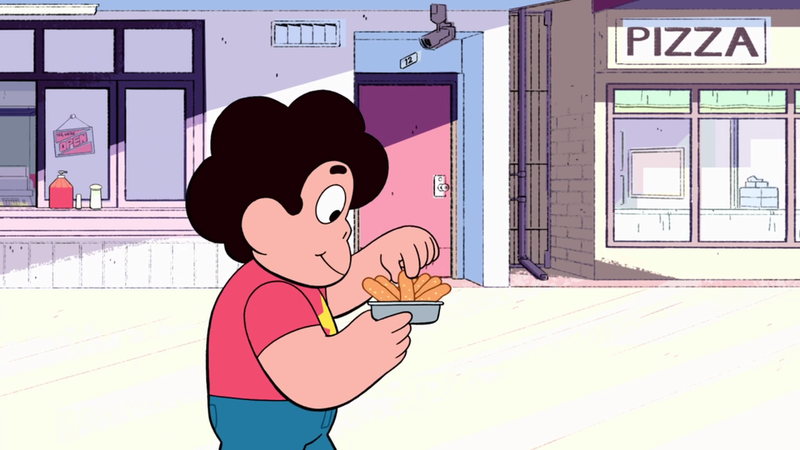 Steven Universe, the main character of the show illustrates this idea well because, by comparison to the pale palette of Beach City itself, the colors he wears are rich and vibrant like his character. Even characters like the young Fryman illustrate this idea in a more subtle way. 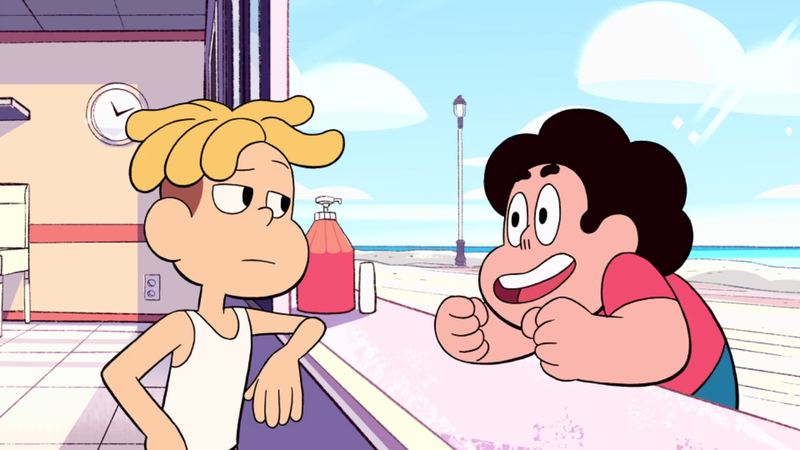 Despite Fryman's shirt being white and his pants a darker tan, the bright pale background emphasizes Frymans french fry yellow hair, which being the fry cook of the show is a large element of his character. What I also like about the show is that just outside the town proper is evidence of this ancient and alien culture that’s existed alongside the town since it’s inception. But where the people of Beach City have built a conventional city according along a grid, that supports very square (albeit beautiful) buildings. 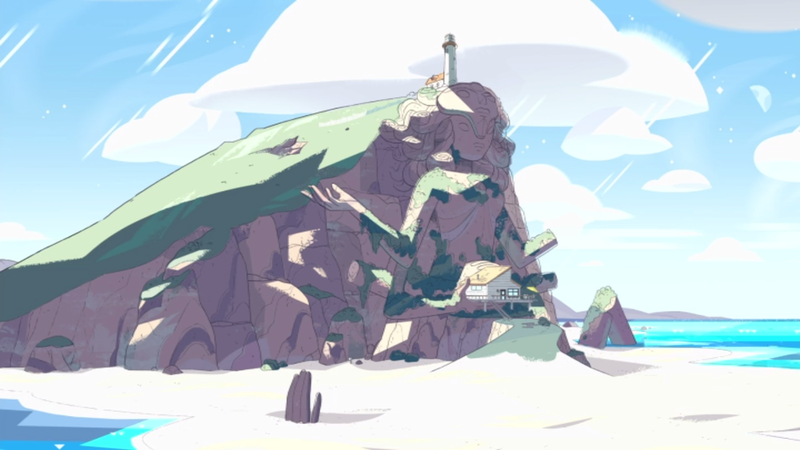 The Crystal Gems (The Aliens of the Show and Steven Universe's Guardians), built there home in the shape of a four-armed alien, into the side of the mountain.